Palette - The tile palette. 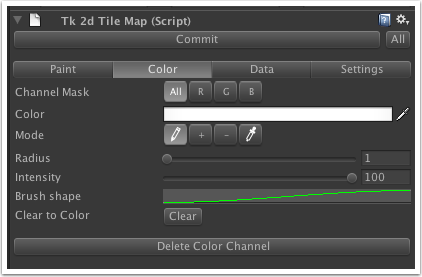 Use this to create a brush by selecting one or more tiles. 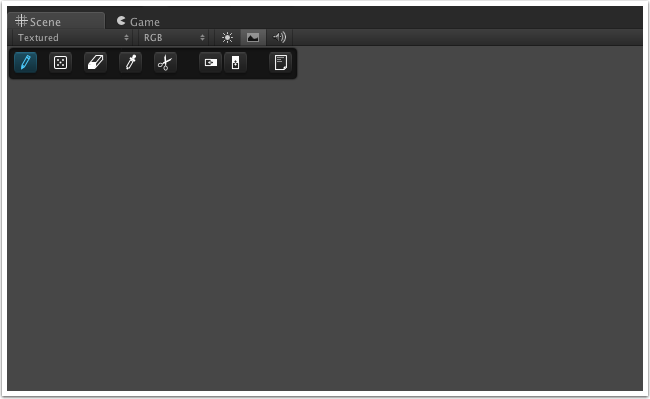 Brush - A preview of the brush that will be used to draw tiles into the tilemap. Cursor Tile Opacity - Opacity of the brush preview at the location tiles will be drawn. Adjusting this can help with visualizing tile placement. Draw - Draw tile brush onto the tilemap. Single-click to splat the brush, dragging a rectangle will repeat the brush. Draw Random - Draws using random tiles from the brush. You can also drag a rectangle to splat brush tiles randomly. Erase - Click or drag to erase tiles. Eyedropper - Select a region from the tilemap to use as the current brush. Cut - Same as eyedropper, but also erases the region. Flip Horizontal - The tile brush used to paint is flipped horizontally. Flip Vertical - Flip tile brush vertically. Scratchpad - Open / Close Scratchpad. 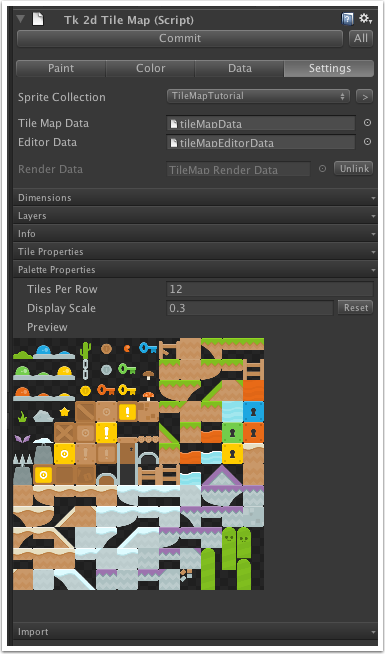 A scratchpad is used like a mini tilemap where you can store different pre-built tile configurations, then pick them up later on to use on your scene. You can have as many scratchpads as you like. It's a good idea to give them names so you can quickly navigate to the one you want using the filtered search. Channel Mask - Affect all or only one color channel while painting color. Color - Set color to paint with. Mode - Normal color paint, Add color value, Subtract color value, Pick color. Radius - Color brush radius. Can also be changed using '[' and ']' when painting. Intensity - Intensity (opacity) of brush. Brush shape - A customizable curve for the falloff (how the brush fades out away from center). Clear to Color - Sets the entire color channel to the selected color. Each type of tile can have data associated with it. 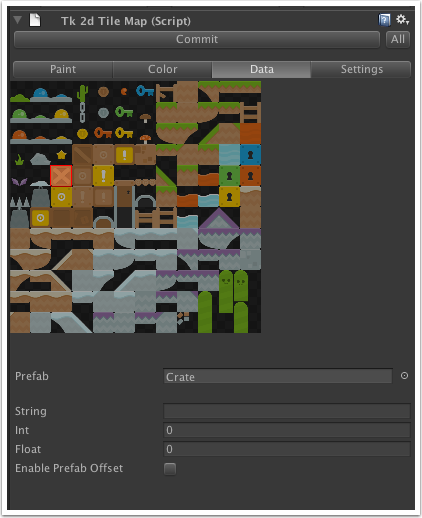 Prefab - The prefab will be spawned for each of these tiles in the tilemap. String Int Float - Data associated with this type, that can be read from the tilemap. Enable Prefab Offset - Enable this to keep the prefab position as a local offset from the tile. 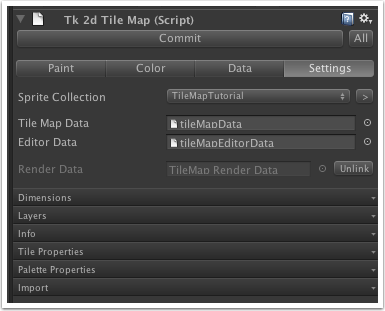 Unlink - Unlink the render objects from the tilemap. New ones will be created upon Commit. Fixed Z - If enabled, Z position of layers is set to 'Z Value'. Otherwise layer Z positions are specified as an offset from the previous layer. 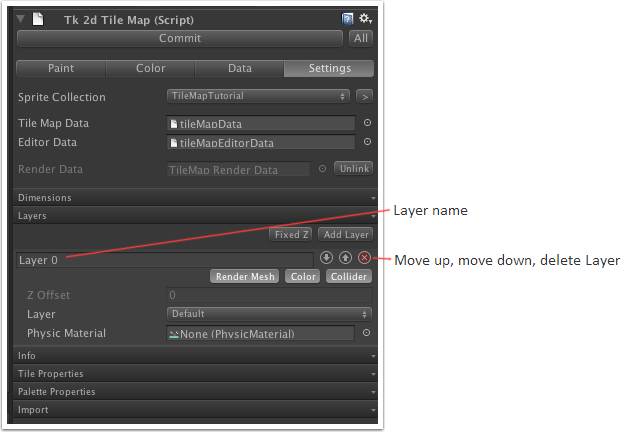 Collider - Enabled if the layer should have a collider mesh when tilemap is Committed. Z Offset / Z Value - Z position, or offset from previous layer. 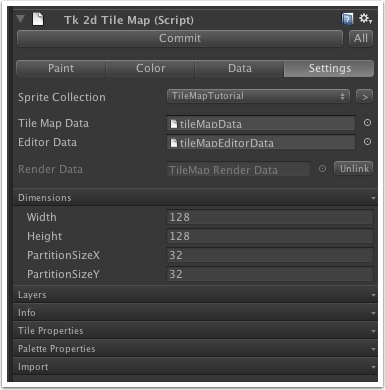 Layer - Unity Layer of the tilemap layer. 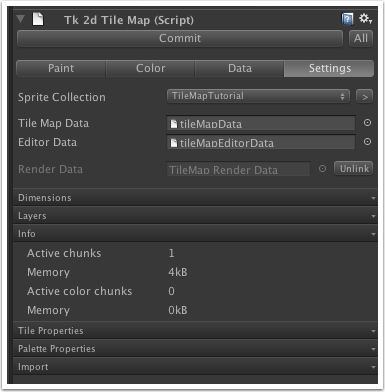 Physic Material - Unity PhysicMaterial of the tilemap layer. Active chunks, Memory - Number of non-empty chunks. Internal tile data memory usage. Active color chunks, Memory - Number of chunks with color data. Internal color data memory usage. Sort Method - Set the order in which tiles are drawn. Useful when tiles have overlapping regions. Reset sizes - Guesses the Origin and Size using information from the sprite collection. 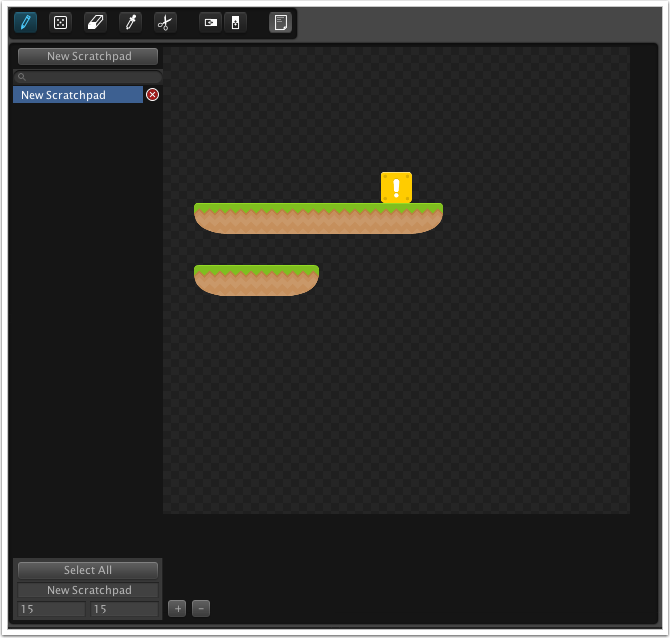 Origin and Size - Set the tile offset and area in relation to a sprite. 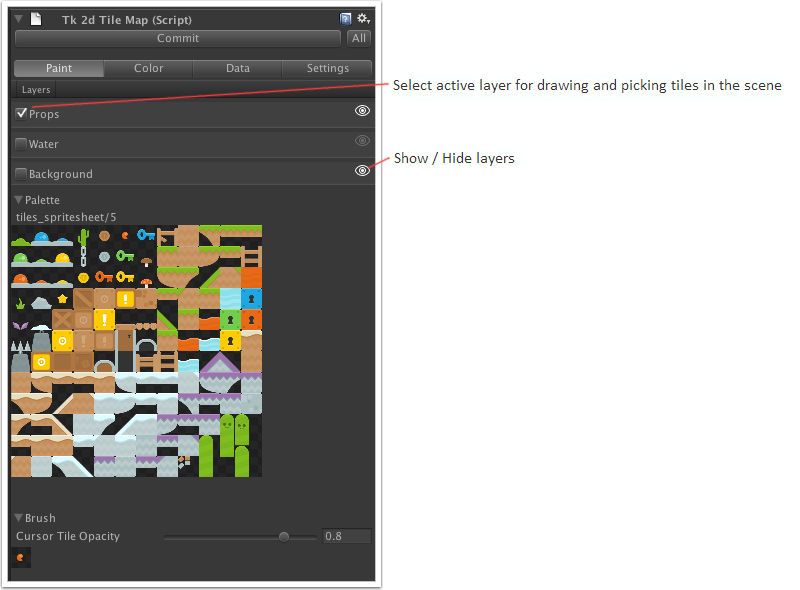 Use the preview in the area below to align the tile shape with an image from the sprite collection. Tiles Per Row / Display Scale - Adjust how the grid of tiles is shown in the palette. 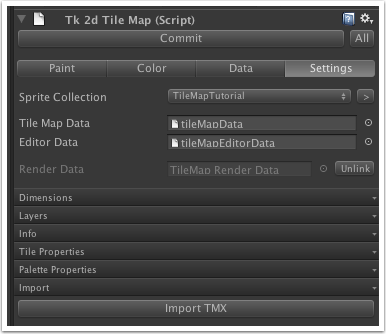 Import TMX - Import "Tiled TMX". The TMX import relies on the sprites being laid out in the same order in the sprite collection as it is in Tiled. The easiest way to achieve this is by using the same sprite/tile-sheet in both Tiled and the sprite collection Spritesheet import. Note: you should not use the 2D Toolkit sprite collection generated atlas as tiles in Tiled, as the order in there is undetermined and shapes might not be regular.